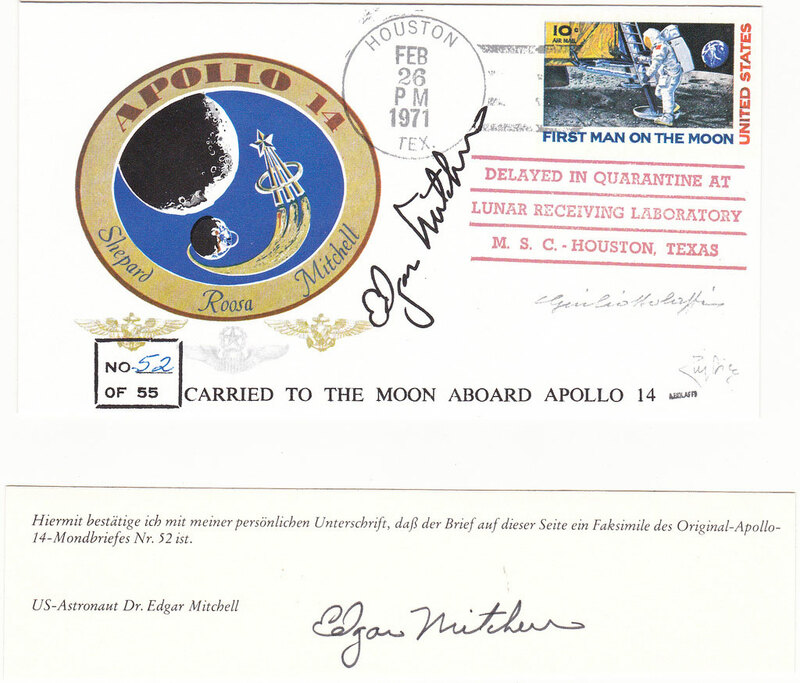 Edgar Mitchell COA signature genuine? 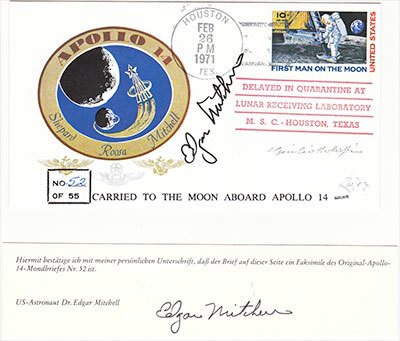 Author Topic: Edgar Mitchell COA signature genuine? I hereby confirm with my personal signature that the letter is a facsimile of the original Apollo 14 moon cover No. 52. Looks different than this "crew insurance cover" (Mitchell's words). Does not match my Edgar Mitchell flown patch COA either. The cover on the top is a facsimile/copy. The cover and signature are a copy of an original. And the note at the bottom contains a live ink signature that verifies the cover above it is a facsimile? Yes, the top is a copy of a moon letter. The bottom is in German and should be a real signature? The Mitchell signature on the bottom looks a little neater than typical, but not to the extent where I'd say it was a fake. If it is a fake, it's quite skilled and deceptive. Looking at the whole picture, it doesn't make much sense to apply a master forgery on a COA for a replica cover. If you were this good at forging Mitchell, wouldn't you be using the signature on something of value? That was my opinion too. I bought it for 14€, it was framed in a nice metal frame which is at least 10€. The only thing I don´t understand why the certificate is in German?